Just rcvd the 256GB SD Card today for my new Galaxy S8+. When I transfer stuff from my phone sd card to my computer I always use the SD Card to USB adapter because it is always much faster. So today I took out my old SD Card plugged it in to the pc using the adapter and copied everything over to the pc no problems. When I plug in the new 256GB SD Card windows gives me the middle finger saying it needs to format the SD Card. The SD Card has already been formatted by Android. If I format it on the computer it only sees 14.5GB of said 256GB card, regardless of what program I try and use, while the phone itself sees the entire card. I am able to put the card in to the phone and transfer files from the PC to the card (in the phone) however it wont transfer the .android_secure folder. Anyone have any ideas on how to fix this? 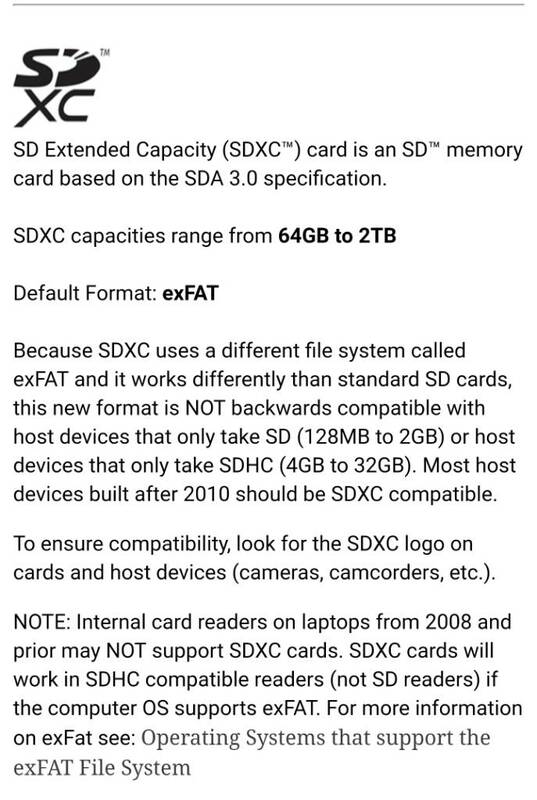 Does your USB adaptor say it takes sdxc cards? Also, what version of Windows are you using on your pc? Yeah your USB adapter might not support it. The adaptor does not specifically say if it supports sdxc cards, though I can say it worked fine with the old 32GB sdhc card. I did try it with a different adaptor (though still a fairly old adaptor) and it did not work with that as well. If it were an adaptor not liking sdxc, wouldn't be an all or nothing deal as oppose to seeing a small chunk of it? I am using windows 7 pro, though I have tried, using the same adaptor, on Windows 8.1 with the same results. It is a real SD card. It is one I got as part of the $99 fully immersive deal Samsung offered as part of getting the S8. It is a Samsung EVO+. What happens if you connect the phone to your pc, can you transfer that way? Here's what I've found. Just wanted to verify. Usually the reader has all the logos on it. See if there's a SDXC logo. As for why it reads only a certain size...not sure. Does sound weird. Haven't tried to install my 256 card yet. Planning to do it this weekend. So I just wanted to update everyone that I finally found a solution. It appears as though the simple micro SD to usb adapter did not support this memory card... possibly due to it being sdxc?? So I went out and purchased an updated all-in-one usb 3.0 SD card reader and it is now reading the card without an issue. Thanks echo_808 for the suggestion, even though I was skeptical at how two cards that I thought had the same pinouts don't both work in the same usb adaptor. Well good to see that was the fix. Use Camera AND (or?) Screen shot to create contact card? Things to know about the Samsung Galaxy S8's SD card slot.